O God, giver of heavenly gifts, who in Saint Aloysius Gonzaga joined penitence to a wonderful innocence of life, grant through his merits and intercession, that, though we have failed to follow him in innocence, we may imitate him in penitence. Through our Lord Jesus Christ, your Son, who lives and reigns with you in the unity of the Holy Spirit, one God, for ever and ever. St. Aloysius Gonzaga's outstanding quality was his radiant purity and the Church praises this perfect innocence with the words, "Thou has made him little less than the angels." He was baptized in the womb, because his life was in danger, and he made a vow of chastity at the age of nine. When he was sixteen he joined the Society of Jesus and died at the age of twenty-three in 1591 as a result of his devoted nursing of the plague-stricken. 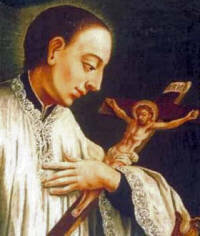 The people who mass-produce statues and holy cards have done St. Aloysius Gonzaga no favors. The standard image of the saint as a frail, doe-eyed novice has given us the wrong impression. It may even be responsible for the decline in devotion to St. Aloysius. Yet Aloysius deserves a revival, especially as the patron saint of teenagers. The time and place where he grew up — 16th-century Italy — is not very different from 21st century America. It was a lax, morally careless, self-indulgent age. Aloysius saw the decadence around him and vowed not to be part of it. He did not, however, become a kill-joy. Like any teenage boy, he wanted to have a good time, and as a member of an aristocratic family he had plenty of opportunities for amusement. He enjoyed horse races, banquets and the elaborate parties held in palace gardens. But if Aloysius found himself at a social function that took a turn to the lascivious, he left. Aloysius did not just want to be good, he wanted to be holy; and on this point he could be tough and uncompromising. He came by these qualities naturally: among the great families of Renaissance Italy, the Medici were famous as patrons of the arts, and the Borgias as schemers, but the Gonzagas were a warrior clan. While most Gonzaga men aspired to conquer others, Aloysius was determined to conquer himself. Aloysius wanted to be a priest. When he was 12 or 13, he invented for himself a program he thought would prepare him for the religious life. He climbed out of bed in the middle of the night to put in extra hours kneeling on the cold stone floor of his room. Occasionally, he even beat himself with a leather dog leash. Aloysius was trying to become a saint by sheer willpower. It was not until he entered the Jesuit novitiate in Rome that he had a spiritual director — St. Robert Bellarmine — to guide him. Bellarmine put a stop to Aloysius’ boot camp approach to sanctity, commanding him to follow the Jesuit rule of regular hours of prayer and simple acts of self-control and self-denial. Aloysius thought the Jesuits were too lenient, but he obeyed. Such over-the-top zeal may have exasperated Bellarmine, but he believed that Aloysius’ fervor was genuine and that with proper guidance the boy might be a saint. To his credit, Aloysius recognized that his bullheadedness was a problem. From the novitiate he wrote to his brother, "I am a piece of twisted iron. I entered the religious life to get twisted straight." Then, in January 1591, the plague struck Rome. With the city’s hospitals overflowing with the sick and the dying, the Jesuits sent every priest and novice to work in the wards. This was a difficult assignment for the squeamish Aloysius. Once he started working with the sick, however, fear and disgust gave way to compassion. He went into the streets of Rome and carried the ill and the dying to the hospital on his back. There he washed them, found them a bed, or at least a pallet, and fed them. Such close contact with the sick was risky. Within a few weeks, Aloysius contracted the plague himself and died. He was 23 years old. In the sick, the helpless, the dying, St. Aloysius saw the crucified Christ. The man of the iron will who thought he could take Heaven by sheer determination surrendered at last to divine grace. Patron: AIDS care-givers; AIDS patients; Catholic youth; Jesuit students; relief from pestilence; sore eyes; teenage children; teenagers; young people; youth. Often portrayed as: a Jesuit with a cross, lily, and skull. At first glance, imitating St. Aloysius seems almost impossible, as he did much penance and praying. But he did have to overcome the bad habits of offensive language. Examine my own habits. Do I uplift others by my tongue, or do I use language that people may question whether I am a good Christian? Do I take the name of God in vain? Do I curse? Do I blaspheme? Do I use profanity or obscene language? I will pray to St. Aloysius to ask God for the graces to overcome my weaknesses in this area. Instead of cooking a special treat for this day, perhaps try a light dinner or lunch, maybe a simple soup and bread to imitate this fasting saint. We have highlighted a vegetable soup, or minestrone from Italy, but pick your favorite to serve.